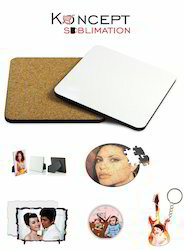 Offering you a complete choice of products which include sublimation rock stones with wooden frames, sublimation wooden sheet, sublimation mdf wall clock - sublimation blank clocks, sublimation wooden table clock - sublimation blank clocks, sublimation wooden key chains - sublimation blank keychains and sublimation mdf key ring - sublimation wooden blank keyring. A good blend of Personalized Print and Utility is our another product 'Sublimation Wooden Table Clock'. Serving our retails clients as promotional and Gifting product This product is another Buzz word in Market Place. 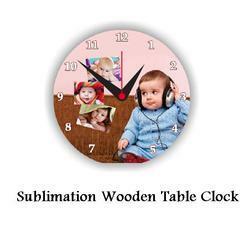 We are serving Sublimation Industry with Large range in termas of shapes and Designs of Sublimation Table Clocks. 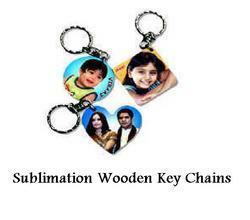 Another Product added to its Sublimation Products portfolio by Koncept Sublimation is 'Sublimation MDF Key Ring'. Targetted to our retails users and corporate clients, These Key Rings can be crafted in any shape of design. These Key Ring can also be printed with any Design, Logo or Message. Made of Fine Quality Sublimation MDF Sheets, These Keyrings have fine looks and delivers best print quality. 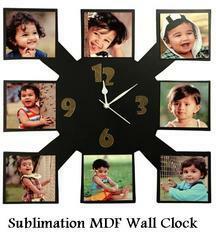 With a purpose of Adding more Utility Products to our Sublimation Products Line, We have added 'Sublimation Wooden Wall Clock' in our portfolio. Beacuse of its fine look and printablity with any Image or Design, This product has emerged as Big Buzz in Gifting Industry. These Clocks are available in Assorted Sizes and Shapes. 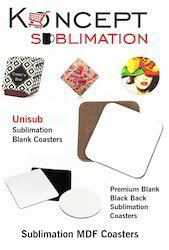 with an option to choose in variety of either plain premium blank base coatsers and Unidub coasters, We at koncept Sublimation are supplying premium range of sublimation printable coasters. Premium Blank Base Coasters in Europion and Unisub MDF. 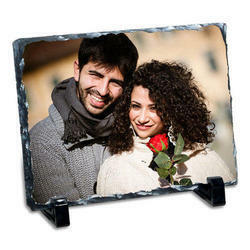 Sublimation WoodenCollages and frames is one of the unique product under the Flagship of Koncept Sublimation. 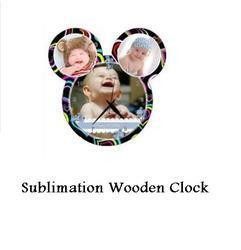 Looking for Sublimation Wooden Products ?